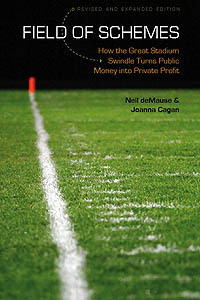 This entry was posted in naming rights, New York Giants, New York Jets by Neil deMause. Bookmark the permalink. I wager the naming rights amount fluctuates based on the performance of the teams. If they play a few home playoff games, Metlife pays more than the $17M base. At least that’s how I read into that reported range. Does that deal also include the airspace above the stadium for the SnoopyBlimp? I think 500 to 600 million makes more sense to me. Otherwise Farmers Insurance really screwed the pooch with their deal because it seems MetLife got a great deal. I mean Barclays paid 400 million on 20 years for the Brooklyn Arena while 400 on 25 years between 2 teams means they got a steal for MetLife. The LA deal is for 30 years, and doesn’t kick in until the stadium is built. I can almost guarantee the back 15 years of this deal, plus the first 15 of the next, would exceed the LA deal.